The latest flight from the groe to near Llyswen was on the 5th September 2014. Piloted by Richard Turnbull and booked by Nick and Kim Smith with two accompanying friends, Tracy Garrett and Jennie Pearce. 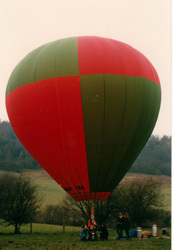 A Short History Of Hot Air Ballooning (since the 1970s) in The Glasbury Area. With the invention of Nylon in the 60s, and production of a relatively lightweight airborne heater unit (Burner), the hot air balloon entered a new era, much changed from its beginnings in 1783 and the smoke balloon parachute displays of the “barnstorming” days. This led to the formation of various syndicates to share the costs of training and acquiring hot air balloons. At first this could only be from manufacturers in the U.S.A. (Raven industries and Piccard balloons). By 1965 the first British manufacturer, M. A. Brighton & Company had formed, and produced the first British built hot air balloon, the ‘Bristol Belle’. Later on Omega Aerostatics came into production, and they developed the first ‘modern’ hot air balloon to fly in the area. 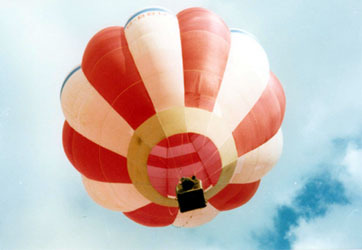 These flights were undertaken by Mark Westwood, flying the ‘Nimble’ balloon (Nimble being a type of bread) in a continuation of an advertising campaign that had been started on location in Spain, followed by one in Switzerland; and latterly on location at Llangorse and Painscastle. All was relatively quiet on the ballooning front in the 70s, with the occasional flight by Mark Westwood from local shows and on other occasions. In 1982 the first flight from The Groe took place. On the 3rd of April, at 07.40, Wing Commander Gerry Turnbull and Richard Turnbull, (helped by Brigadier Charles and Hazel Sanders, along with Brian and Paul Grummett as ground crew) flew for 1 hour 40 minutes, landing at the southern end of the Begwns near Ffermwen. Since then, flying (ballooning) has taken place in the area on an irregular basis for the last 32 years, using various take off fields, from the base of the Black Mountains to Hundred House near Builth. At certain times there have been more intense periods of activity, usually associated with a student pilot needing to gain flying instruction time towards their Private Pilot’s Licence. 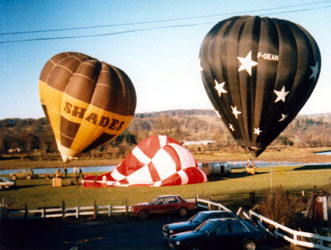 These were notable in April to September 1982, when Simon Forse (now Managing Director of Lindstrand Hot Air Balloons of Oswestry) was working towards his licence; and, in 1985 - January to March - when Mark Dworski (then of Clyro) and Roger Bishop (Knapp Farm Brilley) had acquired their balloon (it was called ‘Shades’ after the wine bar belonging to its first owner) from a friend in France, and were on their way to getting their licences. On occasion we have had visiting hot air balloons fly from the Groe. One notable time was the Royal Bank of Scotland’s hot air airship, doing a test flight (after some modifications had been done to its steering system at Thunder and Colt balloons, Oswestry) on 18th February 1984. Having taken off, we tried to fly up to the old race course on the middle Groe, but found the steering still to be faulty, and the upper winds stronger than we had thought. The net result was we flew in a series of circles, and eventually landed at Grange Farm, with slightly dented pride, but no damage done. As most flights tend to last about an hour, occasionally people will try to fly much further for the challenge this brings to the pilot and crew. During the month of October a competition called the ‘Long Jump’ takes place. This simply involves choosing a launch site anywhere in the British Isles, and trying to fly for the greatest distance within the Isles. So, if you thought it was feasible, you could take off in South Western Ireland, and aim for John o’ Groats. But, as a balloon can only go with the wind, pilots have to make a choice of realistic expectations for their attempts. To this end, there have been balloons launched from Clyro and Glasbury in an attempt to be the furthest flown of that season’s competition. For the record, I have no knowledge of where the Clyro launch flew to; but the Glasbury launch got as far as High Wycombe - which was handy because that’s where the team had driven from that morning. Over the years there have been flights by balloons of passenger carrying type. The largest one to fly from the Groe was one of 180,000 cubic feet, capable of carrying eight passengers and the pilot. On one Christmas Eve we flew with a compliment of local passengers on board over the Black mountains and landed near Monmouth, suitably close to a hostelry where, we could wait for a retrieve party to get to us: we had taken off without arranging for anyone to follow. In general, flights from Glasbury tend to go towards Hereford, as the prevailing wind all over the British Isles is a South Westerly. However, due to our maritime climate, all points of the compass can be expected, depending on the time of year. The most problematic directions are Easterly, towards Sennybridge training area, and South Westerly, towards Pontrilas S.A.S. training area and the main camp at Hereford. Both of these have restricted flying zones around them, for obvious reasons. The only option open to us on these occasions is to land before the restricted area, as the ceiling on the zones is 10,000 feet, and even higher on occasions when high altitude parachuting is taking place. Flying takes place from the Groe with the permission of Mr Richard Eckley of Ffordd Fawr. Flights take place just after sunrise and an hour or so before dusk. No commercial flying takes place from Glasbury.